The Board of Education honored Nutrition Services staff for a great CDE review. Every three years, the Colorado Department of Education completes an administrative review of school districts participating in the National School Lunch Program. This analyzes free and reduced meal service, reimbursement systems, menu quality, meal patterns, program finances, food safety, procurement, employee training, and program outreach. Our nutritional services department recently had this review and was given an abundance of commendations and zero findings of concern! The term the CDE used is Cañon City is a "poster child" for what school nutrition programs should be. We thank Nutrition Services Manager Janelle Grooms and her entire staff for this outstanding work, and for constantly emphasizing what is good for kids over the needs and comfort of adults! 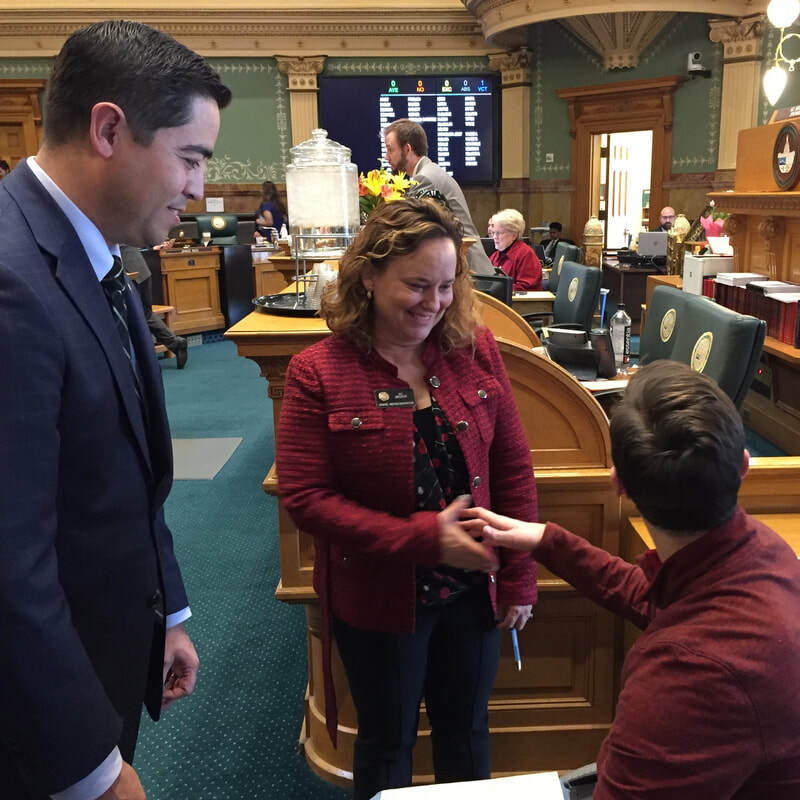 While in Denver last Friday I saw Cañon City High School's very own Clayton Melster lead the House of Representatives in its daily recitation of the Pledge of Allegiance. Clayton was invited to do so by Speaker of the House KC Becker and Representative Donald Valdez. Congratulations Clayton! What an outstanding way to show us the value of taking positive risks! 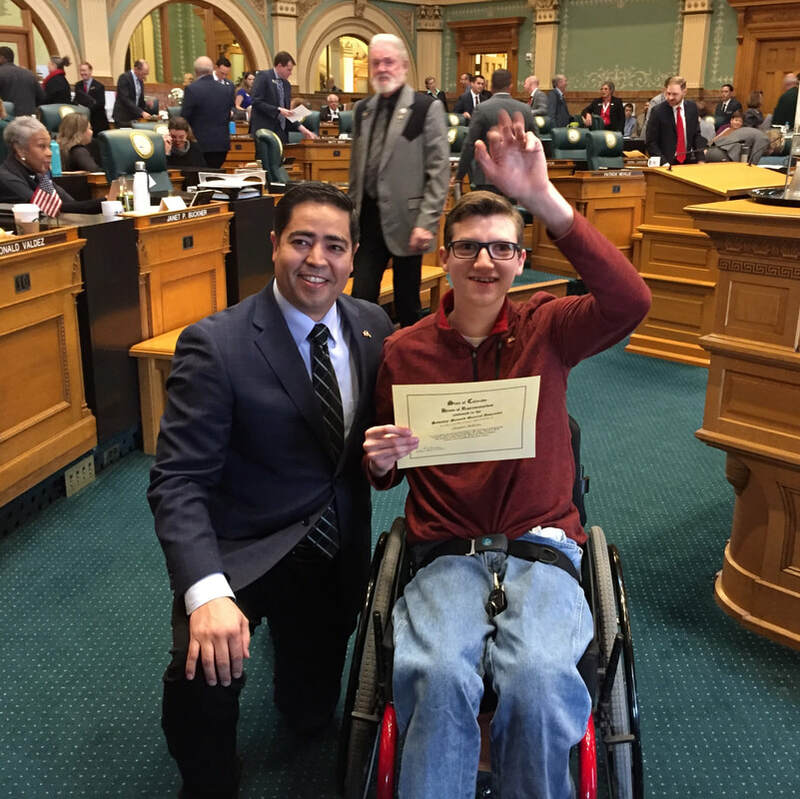 CCHS student Clayton Melster was invited by Representative Donald Valdez to lead the Pledge of Allegiance. After leading the House of Representatives in the Pledge of Allegiance, Clayton got to meet Speaker of the House KC Becker. Pueblo Community College Fremont Campus Executive Dean Linda Stetter has been an outstanding partner with Cañon City Schools. Since her arrival earlier this year she quickly engaged some of our youngest students in seasonal activities around her campus, has begun to participate in our monthly Instructional Leader Professional Learning Community activities, has been a willing attendee of our Civic Canopy community group, and has arranged for many of our high school staff to attend a Junior Mental Health First Aid course she is offering to her own staff. Linda, you truly live by our first core belief about supporting our efforts to meet the social-emotional needs of all students! 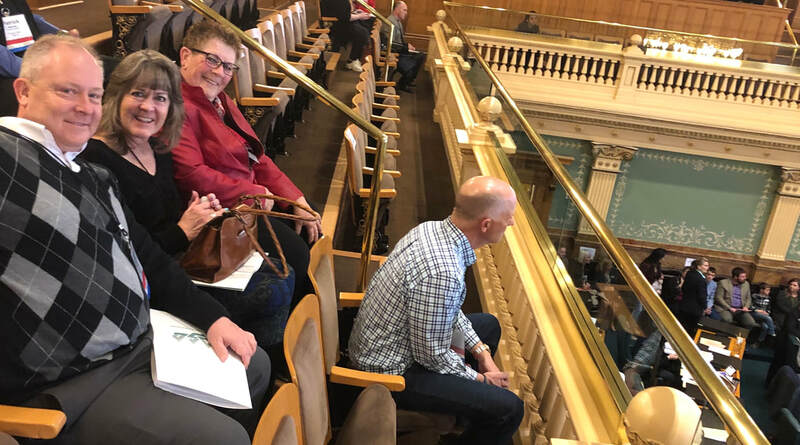 Board members Lloyd Harwood, Robin Reeser and Mary Kay Evans watched the House of Representatives at work. While at the CASB Legislative Conference we had an opportunity to discuss important legislation with Representative Jim Wilson. On Thursday and Friday, I joined board members Robin Reeser, Lloyd Harwood, and Mary Kay Evans in Denver for the Colorado Association of School Boards annual legislative conference. Though there are many education bills we're following closely, our greatest interests lie in possible funding for all-day kindergarten, legislation to expand the Building Excellent Schools Today program to keep it viable into the future, and a proposal to equalize mill levy rates as they apply to local funding of schools. This would bring about greater property tax equity for communities like Cañon City when compared to other communities in the state. While there we had wonderful meetings with Senator Dennis Hisey and Representative Jim Wilson. We also heard Governor Jared Polis speak about full funding for kindergarten and even had the opportunity to meet, and eat breakfast with, Speaker of the House KC Becker. The deadline to apply for the Lincoln School of Science and Technology principal position was last Friday so we'll screen applicants on Tuesday afternoon and interview finalists this coming Friday. With any luck, we'll have a recommendation ready for the board of education in time for their Monday, March 11th meeting. External Consultant Ted Knight, CCHS Principal Bill Summers, and CEI Facilitator Alex Carter observe Lora Eslick's Art class. Vocational Machines instructor Jake Hogan explains how newly purchased equipment requires students to enter a program before making cuts. Vocational Automotive student Kristy Devore explains how she will apply what she has learned to an engineering program she plans to attend. 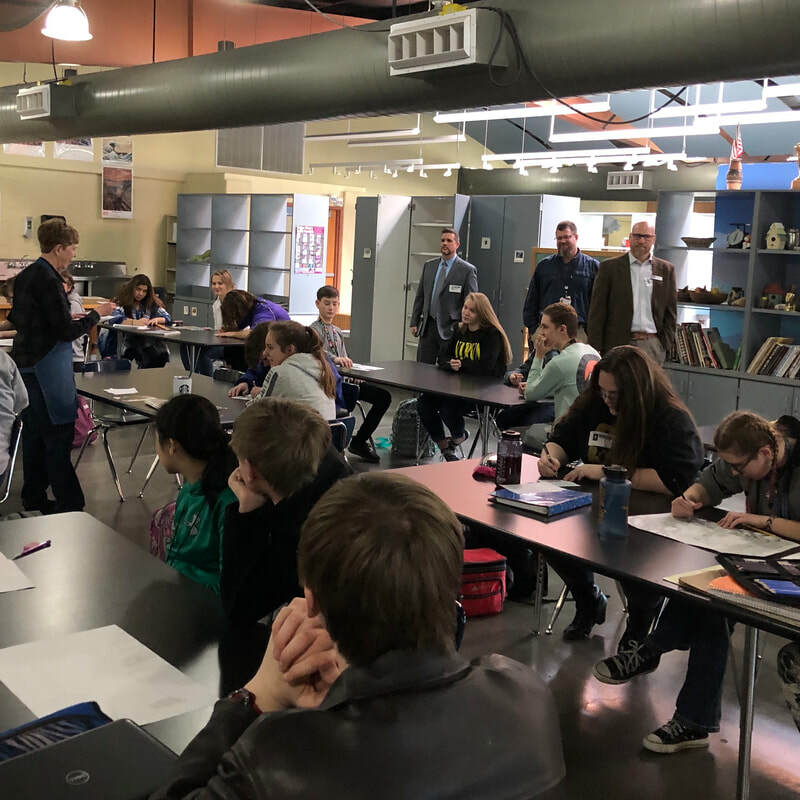 Last Monday a team if internal and external experts visited Cañon City High School as part of its annual instructional review. While on site we observed how CCHS continues to offer some of the best CTE programs in the state of Colorado. From modern machine and welding shops to a growing building trades curriculum to a nationally recognized CAD program, to a world-class automotive education experience, to an extremely engaging technology recycling program, to outstanding business technology curriculum, and the most amazing student intern and apprentice opportunities in Colorado. We also took a deep dive into work accomplished to establish a career pathways program, including the expansion of course offerings, alignment of graduation requirements, and development of a capstone program to go along with it all. We observed a continued emphasis on visual and performing arts. From outstanding instrumental and voice programs to drama and visual arts opportunities, and even to applications of all these in STEM fields through video productions and graphic arts design classes. We also observed the school's focus on restorative behavior practices, an inclusive attitude among staff and students, and the implementation of outstanding social-emotional supports. Finally, we noticed the expert implementation of one-to-one Chromebook devices. I'm not sure any high school has ever been more thoughtful about the way this has been done! 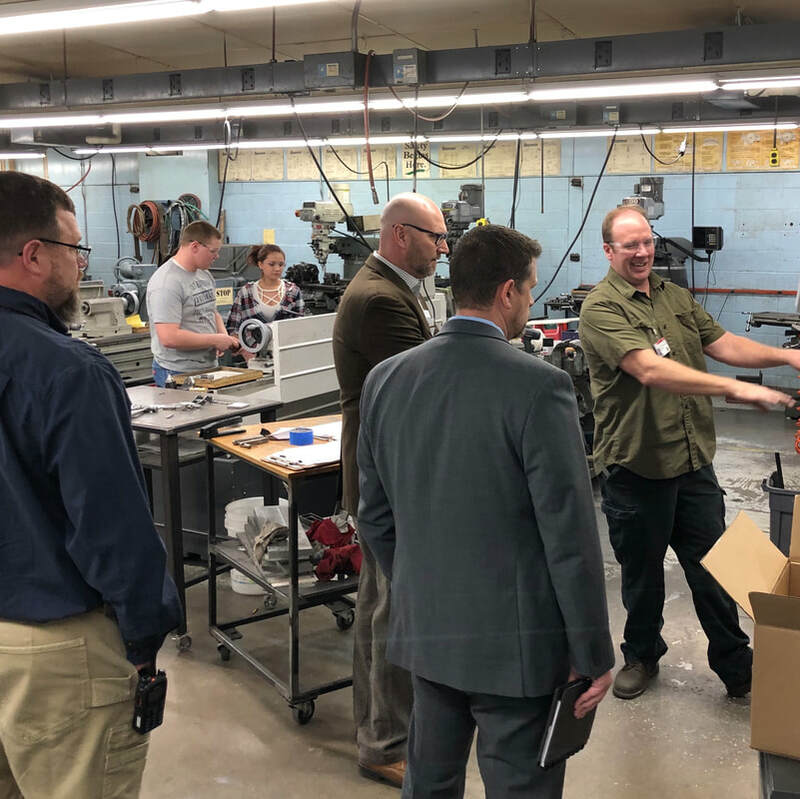 Alex Carter from the Colorado Education Initiative joined in on our visit and was amazed at how much is being accomplished through Cañon City High School's recent transformation process. Mr. Carter made plans to share concepts he observed in our award-winning Tiger Open Pathways program. He also said he thinks Cañon City High School should be a destination visit for CEI's High School Retool program, aimed at showing what is possible when a high school staff works to transform their instructional programs to better prepare students for the future. Principal Scott Morton, Literacy Coach Lacey LeDoux, and Assistant Superintendent of Schools Adam Hartman learn how Cheri Roberts' kinders use Chromebooks. During our recent building instructional review visits to Cañon City High School and Mckinley Elementary, it was quite encouraging to see the varied ways staff are employing Chromebooks in the learning engagement process. A fear for any organization that puts a one-to-one program into place is either the devices will be greatly underused, or just as damaging, way too overused. What we observed in both buildings is a bit of a Goldilocks approach taking hold, where quality teacher-facilitated instruction is still what matters most, and where Chromebooks are simply used as a learning resource. Our most recent construction work has centered on making building mechanical system decisions, minor tweaks to architectural designs, and finalizing key construction timelines so we can make effective use of buildings throughout the process. Last week Cañon City Middle Schoolers visited the UCCS campus as part of their ICAP experience. Last Monday we conducted our site visit for the Cañon City High School building review. That evening we held a board work session during which my annual superintendent evaluation was discussed, and then held a regular board meeting. On Tuesday I attended a Rural Alliance legislative advocacy videoconference, held a weekly Superintendent Advisory Council meeting, met with Fremont County Department of Human Services Director Stacie Kwitek, conducted an Instructional Leader Professional Learning Community, and spent time at the end of the day finalizing mid-year review written reports before attending the Small Business Revolution finalist announcement at Cañon City High School. On Wednesday I started my day on an Opportunity Coalition legislative advocacy phone conference. I then attended a meeting with our partners at the Southern Peaks Youth Detention Center and ended my day working on Building Review drafts after arriving in Denver for the Colorado Association of School Boards annual legislative conference. That's where I spent all my time on Thursday and Friday. I look forward to celebrating Read Across America with Harrison kids this Tuesday evening. We planned on starting our week at Cañon Exploratory School conducting a Building Review, but by calling a snow day we'll have to reschedule that. Hopefully, roads will clear up enough for board vice-president Lloyd Harwood to make it to Denver on Monday in time to testify on a bill to expand the Building Excellent Schools Today program. It's scheduled to be heard in the House Finance Committee at 1:30 PM. On Tuesday I'll appear on KRLN's Morning Line, hold a Superintendent Advisory Council meeting, touch base with Fremont County Communities that Care Coordinator Katie Romano, facilitate the screening process for Lincoln School of Science and Technology principal candidates, and end the day reading The Cat in the Hat at the Harrison K-8 Read Across America celebration. On Wednesday a delegation of Washington Elementary staff will be in Denver to accept their Governor's Distinguished Award for Academic Improvement at the annual Colorado Department of Education State Awards Ceremony. I'll remain in Cañon to conduct a building review at Cañon City Middle School and to attend a CCEOE board meeting. I have a pretty routine day scheduled for Thursday, including a lot of time to catch up on office work. On Friday we have Lincoln School of Science and Technology principal interviews scheduled. 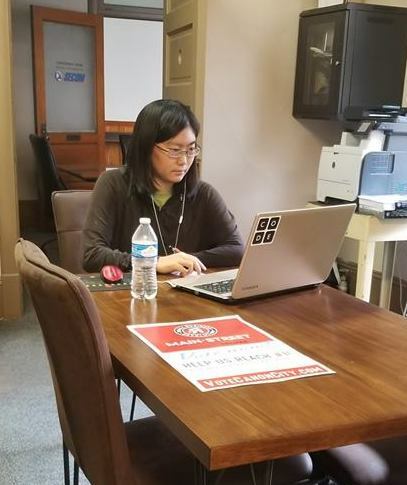 An advantage of her internship at FEDC TechStart is that Yumi was able to work on A+ computer troubleshooting certification. Last week regional Intern and Apprentice Coordinator Lisa Tedesko received this wonderful note of thanks from a student. I think it's worth sharing! I don't know if you remember me, but I was in the PaICE internship program before graduating in 2018 and I interned at TechStart with Gregory Carlson. While there, I also got to know the others involved in TechStart including Brad Rowland with FSLogix. Brad introduced me to Chris Koehn, who is the co-founder of Abacus Solutions Group - an IT company that works with the army, and after hearing about me from Gregory and Brad offered me a job at the Second-61 tech service desk that is currently being set up here in Cañon. For someone who adores any and all things tech, being offered a job like this is an absolute dream. But, to get to the point of this email, I wanted to thank you. Thanks to the experience I gained in the PaICE program I've been given an amazing opportunity. As someone fresh out of high school with no college education, this is something I could never have expected, let alone believed could happen, were it not for you and the PaICE program. I'd like to meet with you sometime to thank you in person and share a bit more about this wonderful opportunity that I've been given if you'd like to hear more. I can't thank you enough for what you've done through the PaICE program and I just wanted you to know that it has certainly changed the course of at least one former student's life for the better. Thanks for sharing this wonderful story, Yumi, and to everyone else for listening once again!